The play wasn't called "A Riotous Time". It was called "Running Riot". The summer weather seems to have returned. Yesterday it was in the 80°s. Yesterday some of us went to Fr. Fisher’s S.M. funeral. He was Parish Priest at Hastings, & was the priest who was staying at “Highden” last year for Cobalt Treatment. He had been bed-ridden and unable to talk for several months, & had been breathing through a pipe sticking out of his neck. Some of the Fathers from S’Stream were there. Yesterday afternoon Bernard Cuttance called in to see me. He has got 8 Engineering Units so far at Canterbury. Harvey O’Sullivan called in this morning. He has got 6 Mechanical Engineering Units – also at Canterbury. Harvey & Bernard are flatting this year together with two other engineering students. 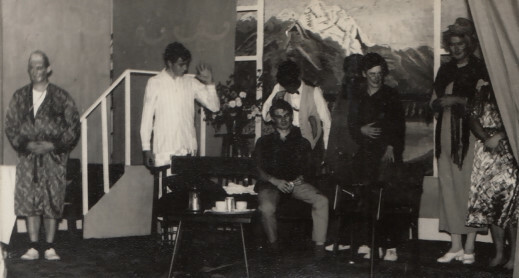 Did I tell you that I have been asked to have a part in this term’s play called “A Riotous Time” – or something like that. I don’t know any more about it than that. We will probably begin sometime this week. We played St. John’s at cricket today & won by 6 runs. I am not doing English II because it would probably mean too much work. Fr. Elsom, from the Marist Seminary in Australia, called in this week. He is a graduate both in law & theology, & is just returning from the 1st session of the General Chapter of the Society in Rome. On the way back he called in at many of the seminaries. Some of them seem to be going through rather difficult times. San Francisco has only one Aspirant this year (a Jewish then Buddhist then Methodist then Catholic convert!) The Australian Marist Seminary Course is now extended to 9 years – 3 years at University. But this is only at the experimental stage at the moment & runs the risk of losing some vocations besides other problems too. However, they have the advantage of being within driving distance of 3 Universities! Fr. Arbuckle arrived back on Friday. His mother is in hospital. We are going to watch a film tonight, & before that we are going to watch a film on T.V. on the Seminary (it lasts for ¼ of an hour). Last week the photographers were up here making a film. Only the senior band are in it. Last Thursday at Debating Club I gave a speech on “Poisons” - & why D.D.T. has been banned, etc. Next Sunday, the morning of Visiting Day (1.15 p.m. - !) the Bishop will be here for ordinations. On the Saturday, 6 will be finally professed (including Pat evlin & Br. Jim Brownlie [who was at Otaki Maori Camp]). On the Sunday 6 others will be ordained Deacons – Bro. Tapp, O’Connell, Wooller, MacManus, Benton & Walls (Mrs. Walls’ nephew). The Theologians (4th, 5th, 6th & 7th year) go into retreat on Wednesday, & then come out after Ordination. The Philosophers continue classes as usual. I don’t know when grape-picking will be. Different rumours come out every day. I think that that must be most of the news. I don’t suppose you’ve had any rain yet. Looking forward to seeing someone on Visiting Day – if anyone can come up. Don’t forget the shell, & the books on shells & insects (they are a pale blue & a pale green books, not the yellow & black one for I have it up here already). Also I was wondering if those photos I took at Highden had been developed… & I was also wondering if there were any cuttings growable in your garden which would be good for my section! Well I think that that’s all the orders!